Southpaw was built over a long period by the owner and his son (a professional boatbuilder) and was originally designed for a duoprop drive/steer system. However on studying maintenance time/cost requirements for this drive system, it was then requested to change to standard shafts, props etc. This required hull design alterations to allow changing from stern drive motors/legs to Yanmar motors with V drive gearboxes mounted directly to motors. 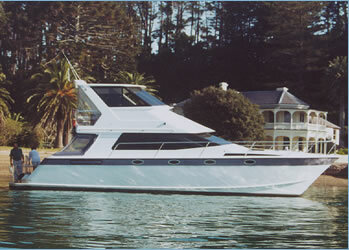 End result of this configuration change has been successful and this powercat has been involved in New Zealand northeast coastal cruising and is now based in Tauranga. Semi enclosed flybridge with toughened glass windows.